1. Heat oil in a pan, add the bacon and cook until cooked and coloured. Reduce the heat and add the pepper and onion, sweat for 2-3 minutes. Stir in the sweetcorn and butterbeans with the chicken stock and bring to boil and season. 2. Reduce chicken stock then add cream and bring to the boil until it thickens and add parsley. 3. Meanwhile, combine the curry powder and flour together on a plate, then lightly dust both sides of each scallop in the mix, before searing quickly in a hot frying pan, for a minute on each side. 4. 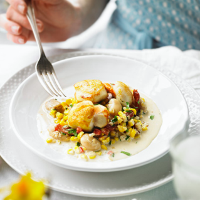 Serve the succotash into bowls topped with 3 scallops per person.